For those who have read my blog before, you’ll know that I like to either apologize in limerick or honor someone in same way. It’s my way of bending my knees in print. Today it’s all about honor. 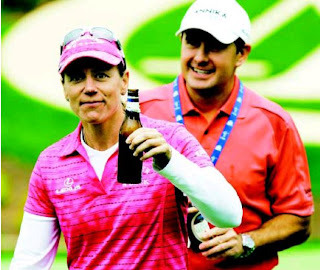 Annika is someone who I have admired from the moment I picked up a golf club. I can’t write anything that hasn’t already been written about her, but I can say that she will be remembered for lifetimes beyond mine and for that she should be very very proud. Her legacy deserves immortality. For those with discriminating taste…click on that little “X” at the top right of your screen and escape this pathetic pass for poetry. But for the rest of you…read my Ode to Annika and then go to her blog and tell her that you miss her already! She’ll be missed on the LPGA. I looked throughout the world of news for the right story from a real reporter (not AP or Reuters) who could spin a tale about Annika. I think this story below fit the bill quite nicely. Liked seeing the quote there from Tiger. Class, pure class, that’s what Annika is. I’ve never heard anyone, players, press, etc. have anything negative to say about her. As great a golfer she is, I’ll bet she’s a better person. Annika will be missed for sure!